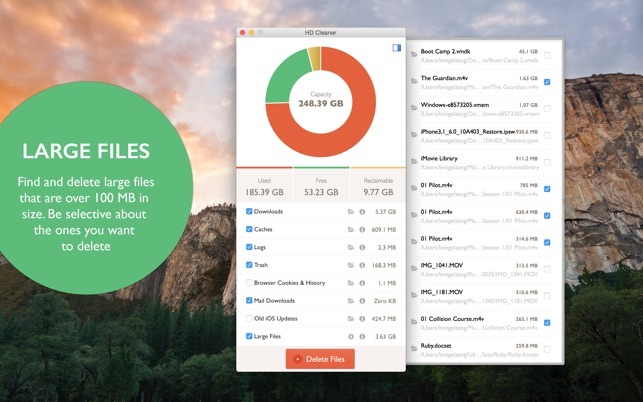 Remove gigabytes from your hard drive in just one click. ◆ Overview Graph: visualize how much space you have available and how much you can clean up. 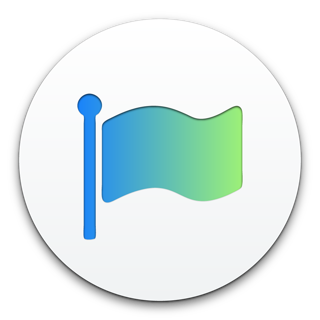 ◆ Quick Access: quickly access and learn more about what files you'll be deleting. ◆ Customization: Pick what you want to delete based on your needs. 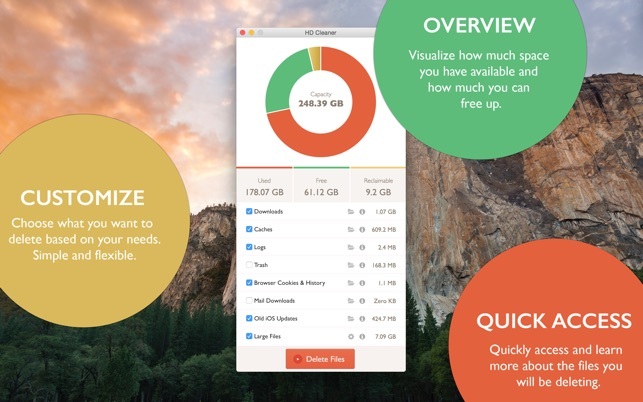 ◆ Quick Cleanup: It only takes one button to free up gigabytes of space! 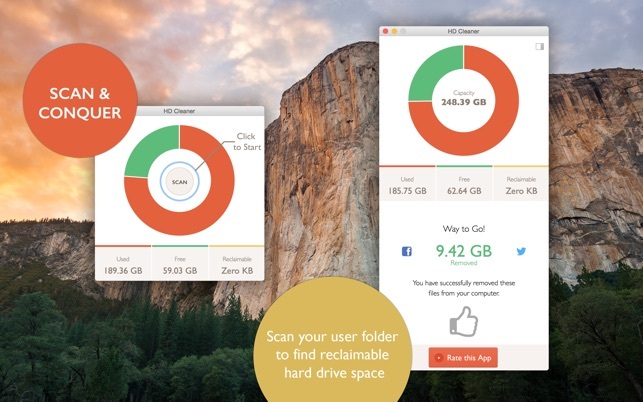 HD Cleaner is the easiest way to clean up your hard drive. Download it now! Fixed font loading bug that was causing crashes in Yosemite. Not worth what it costs, hardly worth anything! I purchased this totally worthless app and wish I could get a refund as this doesn't tell me anything about what programs are using how much data! It's too simplistic and your Mac's finder will give you a better idea of what's taking space on your hard drive and the location of duplicates! Pay $5.99 at the App Store, download this worthless app HD Cleaner, Open HD Cleaner, by clicking on "Click to start" on the interfaces "Scan button" to find out how much free space is left on your drive or simply click on your Mac's Hard drive icon then press the Command Key (Flower Key) and and then the letter I key on your Qwerty Keyboard for free and get the same info! Stupid wast of money!!!! inferior product!!!! Please refund my money! I was under the impression this was a bit more comprehensive a program, obviously it's not! If I could have rated it no stars, I would have! Very disappointing product! Awesome, NOT!!!!!!! Before using this application, I wasn't able to save a single song, picture, or even word document. I searched and searched through my macbook pro to find where all the used storage could have been coming from, and I absolutely couldn't find anything that was taking up an incredible amount of space. HD Cleaner is simple, easy, and fast to use, and immediately showed me where all the hidden files were that my computer wasn't allowing me to access and see. I was able to reclaim over 15gig on the first use, and I am so grateful that I did. I would 100% reccommend this app! 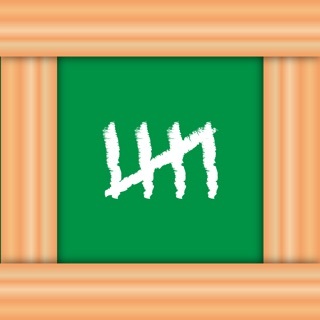 I expected more from this app, maybe HD Cleaner will update with better features. The only thing is good for is wiping out web data and cokies in case sensitive information is in browser memory, it also cleans out the trash. Buy if you want but if something better catch your eye, I would have taken my chances with the other choice. One thing I can say is at least this app has a use!